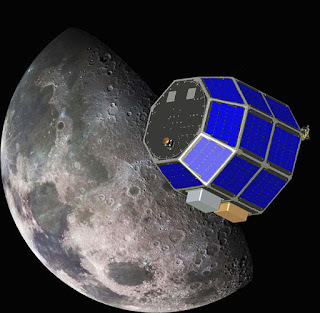 NASA has a press release here about an upcoming probe called LADEE (Lunar Atmosphere and Dust Environment Explorer) that will study the Moon's extremely tenuous atmosphere beginning in 2012 when it launches. The Moon has such a tiny atmosphere that the whole thing put together has a mere ten tons of mass, which is why human colonization will quickly change it into something completely different. Rocket exhaust, escaped gas from human settlements etc. will not take long to completely remake the atmosphere into something quite different which is why a mission like LADEE is needed now. It would be a good thing to create a thin atmosphere for the Moon though, as detailed here. There is probably a certain level of atmosphere that can still keep the Moon in largely the same condition it is in now, but with some simple wind patterns and just enough atmosphere to keep the smallest of micrometeorites from being able to fall down and cause havoc among human explorers when least expected. Looks quite big but that's only 1/70,000 that of Earth, and nothing even compared to Mars which is still almost a vacuum in terms of human physiology. The article also provides an interesting view of how ice could have collected in the cooler parts of the Moon by having H2O molecules jumping about until they reach parts of the Moon that are cool enough that they settle down and remain undisturbed. Enough time with this process and one ends up with a soil containing permafrost from which water can then be extracted by human explorers.